From Twillingate we drove to St. John’s, the largest city within Newfoundland and where most of the young people move to live and work. There’s a University there where several of the parks summer hires go to college. 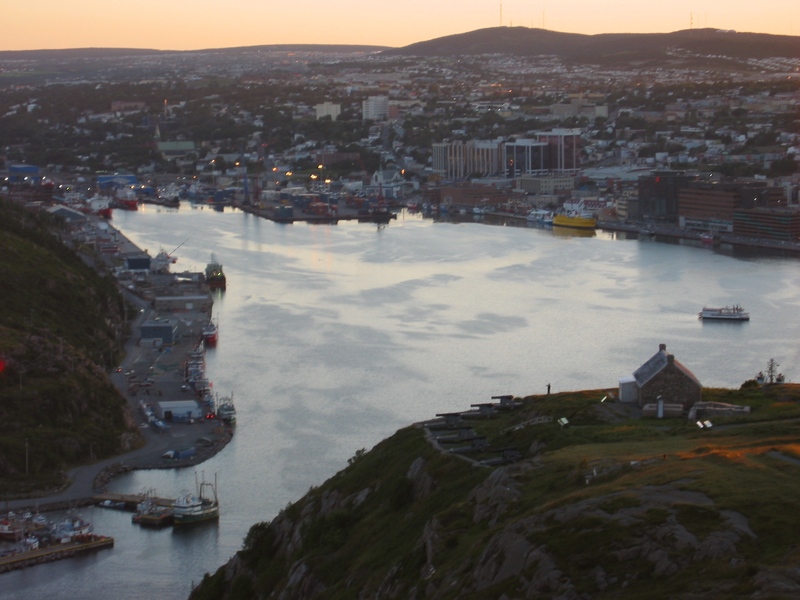 The photo above is taken from Signal Hill, which overlooks the harbor entrance. 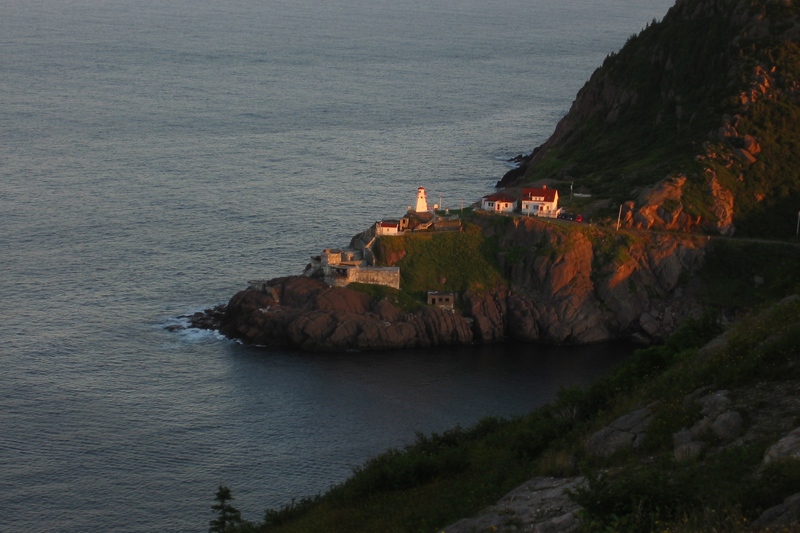 Here’s a photo of St. John itself – just through the inlet shown above. It is a working harbor. We drove the RV up to Signal Hill, through town and out again. We were amazed it could make it up and down these hills. We certainly got a few looks. We even met a real Newfoundland dog on Signal Hill. The drive from Twillingate to St. John’s was horrendous. Pouring, blowing rain so thick Chris had to stop a couple of times to wait it out. We drove over a road that definitely needed some repair. And she started grinding her teeth when the fuel needle dipped below the E point. I had reassured her that there would be diesel available “in the next town” one town too many. In her own style, she was mad at herself for letting me talk her into it. I was thrilled when a restaurant waitress told us we would find diesel “just a couple of miles down the road” once we finally turned off. It was more than a couple of miles – but we rewarded her by going back to eat there (and doing some attitude adjustment) after we filled up. Needless to say, once we arrived at St. John’s to find “Pippy Park” all booked we were happy to park in their “overflow” lot with no services (picture a large gravel lot with RVs parked wherever they’ll fit – that’s what it was). We had no energy the next day and read our books, taking another day off from touring. We stayed in the overflow lot again the next night and then continued on our way.